English music producer Simon Cowell once told Rolling Stone Magazine, "You have this amazing thing now called fan power. The whole world is linked through a laptop. It's absolutely brilliant." He was talking about music artists here, but this can apply to any type of event host or marketer. 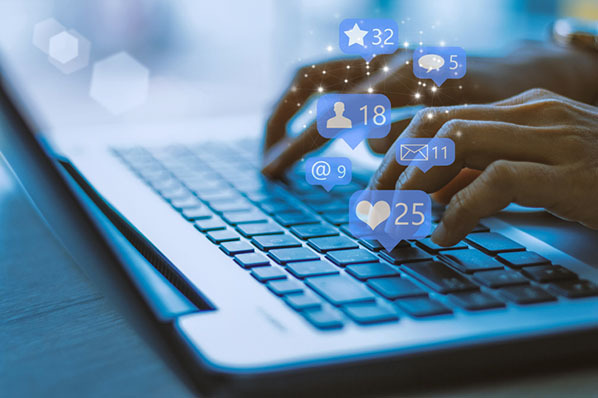 Social media allows us to promote our events more strategically, listen to and engage with our fans, enhance attendee experience, help measure the event's overall success, and find areas for improvement in the next time you put it on. Music festivals have a lot to teach social media marketers about using Twitter and YouTube to promote and enhance attendee experience for their own events. To help extract some of these lessons, we looked at a few major music festivals in the U.S. and Europe. 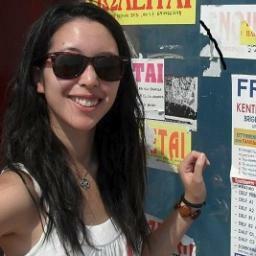 How do they use Twitter to ensure their event runs smoothly? How do they use YouTube for advertising?And how can they leverage Twitter engagement to identify the emotions their fans expressed before, during, and after the event? Let's tune in to some of this year's biggest festivals -- from Coachella to Tomorrowland -- to see how smartly they leveraged social media, using insights and metrics provided by advanced social media analytics tool Talkwalker. 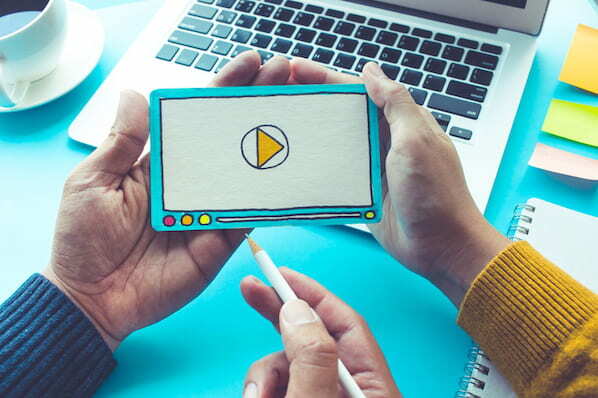 What better way to tell prospective attendees what your event is going to be like than showing them videos from past iterations? The folks who market Belgium's famous music festival, Tomorrowland, got 37.4 million views and over 250,000 likes on their promotional video, as of this posting. That's 10X as many views as Sziget, Coachella, EDC, EXIT, Lollapalooza, and Bonnaroo combined. Looking for a way to amplify your message? Twitter is one of the best avenues for broadcasting constant and timely information about practicalities, codes of conduct, recycling, health and safety, on-site activities, and much more. For inspiration, let's take a look at some of the best examples of how music festival marketers use Twitter during their events. What happens if you ignore your attendees on Twitter? "Which is the best parking entrance?" "Where can I see the program?" Nowadays, when event attendees have questions, many of them will turn to Twitter for answers -- and they'll expect a response. Quickly. Twitter is a great way for organizers to provide assistance to a wide audience in a timely and cost-effective manner, provided you use a good social monitoring system. This way, event hosts can both keep visitors happy and detect early signs of crisis, which will likely improve sales on-site and encourage attendees to come back again next time. 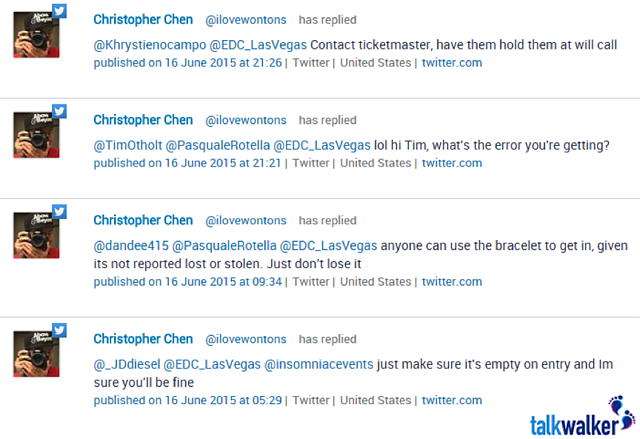 In our social media analysis, we noticed that Electric Daisy Carnival, a music festival based in Las Vegas, wasn't properly monitoring their Twitter feeds. They announced the hashtag #EDCHELP ahead of time as an official hashtag channel for all customer inquiries -- and yet, no representative seemed to have taken charge of answering any of the questions and complaints posted on Twitter. The result? 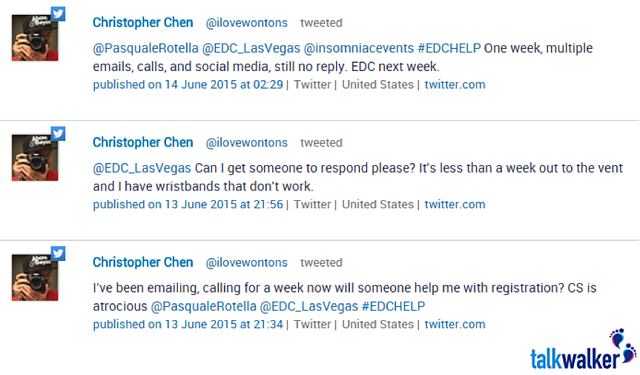 Regular festival-goers like Christopher Chen suddenly found themselves becoming spontaneous customer service agents. He saw that no one was answering people's questions on the #EDCHELP hashtag and took it upon himself to provide information and advice to random fans. Hashtags now play an essential role in increasing the social media presence of brands because they encourage discussions online. Once you choose and announce an official event hashtag, be sure to use it in every single tweet about the event, even if you have to shorten the copy of the tweet itself to make room. While many events create official hashtags (like EDC did with #EDCHELP), it's also interesting to analyze the unofficial hashtags. These are hashtags attendees tweet that make sense to them when they don't bother to look up the official hashtag. 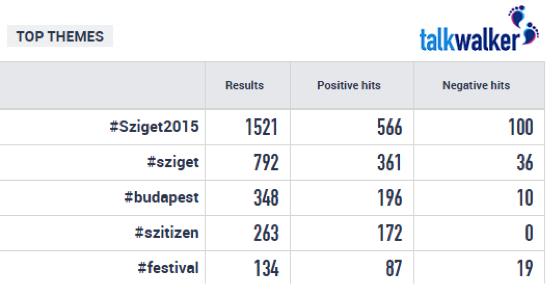 For example, the Budapest music festival Sziget's trending hashtags this year included #Budapest (which is great news for the city's tourist office) and #szitizen, which is related to their Mission:Szitizen game, an international game the music festival's marketing team put on with the goal of inspiring the most dedicated Sziget fans to show the whole world what they got. Here were the trending hashtags for California-based festival Coachella (left) and Tennessee-based festival Bonnaroo (right), along with figures on their use over 30 days, both overall and split by positive and negative sentiment. How are people feeling about your event? 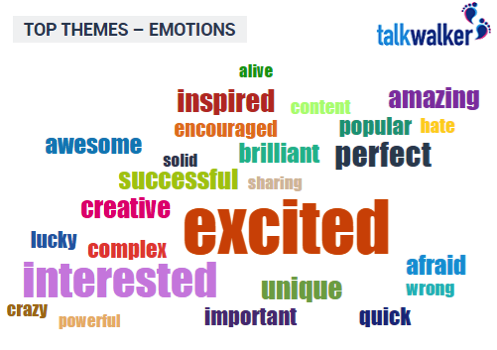 We thought it would be fun to see how people were feeling about Lollapalooza, a Chicago-based music festival that takes place in late July and early August each year using the keyword cloud from social media monitoring tool Talkwalker. Vibes were positive: The word "excited" came up first in terms of volume with 633 hits over the last month in combination with the word "Lollapalooza." It's interesting to compare the performance of top keywords related to one event over a series of iterations. How did people feel about Lollapalooza last year compared to this year? Which words came up at what volume over the last few years? Keyword trends as a whole will also help you come up with the right wording in your next social media and SEO campaigns, and can ultimately help you differentiate your event. These are just a few of the social media marketing tips that we recommend to event marketers. Have more tips? Share with us in the comments, or tweet us at @Talkwalker.